This post is about how we understand complexity, and how we can change this understanding of complexity. I have previously written about the 2010 IBM survey on complexity – 1500 face-to-face interviews—the largest known study of its kind with CEOs from companies of all sizes across 60 countries, representing 33 industries. Previously, CEOs have consistently identified change as their most pressing challenge. Today, CEOs are telling us that the complexity of operating in an increasingly volatile and uncertain world is their primary challenge. And, a surprising number of them told us that they feel ill-equipped to succeed in this drastically different world. It is hardly surprising that CEOs feel ill-equiped to deal with complexity, when it is not a subject taught at school. Indeed, Complexity Science is still young as a discipline and there is no single coherent body of work which we can point to and say that this, this is Complexity Science. In universities and business schools, complexity is still not taught within a single department, it is more a case of being a multidisciplinary subject brought together in schools or centres of excellence, such as the Complexity Group at the London School of Economics. I thought I would share some research I was able to carry out with post-graduate students at Sustentare Escola de Negócios (Sustentare Business School), Joinville, Brazil. It is here where I teach complexity theory to business students, most of whom are managers and executives from some of the largest companies in the region and indeed Brazil itself. Last month I was teaching a module Complexity, Human Resources and Education (Complexidade, Capital Humano e Educação) to students who were predominantly from an HR background, and I have previously written an article about the contents of this course. As part of the module I was able to ask them to fill in a short questionnaire both before the course began, and also after the course. I design these questionnaires to really help the students explore the issues I will be teaching them, and to help them think about how they can apply the knowledge back in the workplace. In case you have not already seen it, my teaching is based on three main components, teaching new business models, teaching complexity theory, and exploring mental models. In this article I want to explore people’s mental model of the concept “complexity” since for me is an extremely rich word to explore, meaning very different things to different people. Complexity is related to the number of elements, processes, variables, and connections involved. Something hard to do and understand. Something unknown, for example, for me, to operate an aircraft is complex, because I do not know how to. It involves a complex world with an accelerated speed of change and innovation. Associate words: innovation, technology, creativity, relationships, quality. Something that may seem complicated, which has several points of view, which can be confusing. I define complexity as a junction of variables, assembled together, making it more difficult to understand the individual analysis of these variables. So here we have many very typical definitions of complexity, referring to the difficulty of solving problems with many components, variables and relationships between them. It is no great revelation to point out that the word complex is often associated with the word complicated. Sometimes though this can disguise the reason why something is difficult to understand. 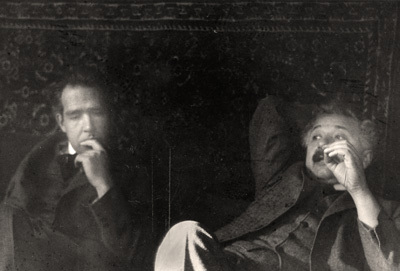 In the 1920s Einstein and Bohr were great friends, and there were many profound conversations between them. But towards the end of their lives they drifted apart due to a breakdown in communication between them. Henri Bortoft, a teacher of mine who studied the problem of wholeness in quantum physics under David Bohm once told our class that in fact quantum mechanics is quite easy. So long as you can understand the mathematics, then it is then not too difficult a matter to apply. The mathematics have long since been worked out and pretty much all physicists can agree on them. What they can not agree upon, and this applies to the breakdown between Bohr and Einstein, is the meaning of the mathematics. This is a great source of complexity in human systems, since most communication issues relate to the meaning of things, and the fact that not only do we have different mental models which pretty much always we fail to acknowledge, but that also much of this knowledge is not symbolic, abstract and logical, but lies within our intuition. So what happens when business students are taught complexity in a way in which first goes into great depth examining mental models? Well I can assure you that for students it can be challenging in the extreme, as it is much easier and far more comfortable to stick to what we know, or what we feel to know to be true. I am not challenging facts, but challenging students very fundamental world views, how they see the world, and how they think and feel about what reality is, what knowledge is, what seeing is, what causation is. These are all great challenges that scientists have grappled with throughout the ages, but we so very rarely address these issues in business, and when we do, the discussions can often seem philosophical and students can miss the application to very real problems in the business world. In my small survey, 15 out of 17 students responded that they felt their mental model of complexity had changed. Of those two who said that it did not, they still replied that the course had very much changed the way they looked at complex issues. I’m more sure than ever that we must think of the possibilities and have an open mind always looking for an alternative to the many challenges. My initial idea was that complexity was directly related to the difficulty, the impossibility of fulfillment. But now, for me, it is synonymous with complex web of relationships, where I realize that the greater the number of connections, the greater the complexity of the system. What makes a complex system is the possibility that an action accrues as a result totally unexpected compared to what was expected, due to interactions which promote changes, alterations, and bring different meanings to other system elements. Bringing this concept to the corporate world, it is easy to understand the desires of today’s executives with the complexity of the modern world. It is no longer possible to predict future scenarios in the medium term and draw a straight line towards the expected results. It takes flexibility, reorganization, structures and adaptable to changing needs immediate (emergent) response. Today I see complexity as something certainly complex, but necessary. We studied how nature is complex and that everything is in place which should be there, having a function. And organisations also work that way. We need different people, people with different ways of seeing things, different ways of seeing the world. And there should be this balance between the types of people, the mix of skills, different ways to solve problems. It’s fantastic! Yes changed a lot. Now I understand that complexity has a direct relationship with nature, with the peculiarities of each organism in each system. Yes, the concept that I had before was very restricted, it was just something complicated, difficult to understand. Now, I realize that complexity is much more than that, it is somehow a relationship between order and disorder, and the knowledge society, between man and nature. My concept of “complexity” has become more “complex” … I now define complexity as an integral view of situations which at first sight are difficult to be understood due to their great interactions, but when seen in detail it can be seen that they are simple in essence. Complexity becomes to me that we are part of a whole and that “all” need to interact so that there is an end. Being in the organization or society, we must live with the differences and make this difference the opportunity to achieve a goal / objective. I now define complexity as an organic system composed of chaos and order, where a holistic organization becomes sustainable, strategic, and develops and evolves with balanced growth. Obviously it is extremely rewarding to see these range of responses, and to know that it is possible in a relatively short amount of time to radically change people’s mental models, so that they can really begin to see complex issues in a new light. What new light is this? Well the reason for studying complex systems in nature is that nature, on the whole is complex, and these complex systems of nature are organic, dynamic and non-linear. The systems of nature can not be understood by thinking of them as a machine, as a piece of clockwork, as an engine, or as a computer. You can not understand an organic system by breaking it down into parts, you have to perceive it as a whole, and in the last three answers we see this more holistic perception in the students’ answers. As Basil Hiley, a colleague of David Bohm says, reality is organic, that is its fundamental nature. It is not that mechanistic thinking is not valid, it can be in certain situations, but in order to really understand an organic system in its totality (if that in fact is possible), you have to think organically. 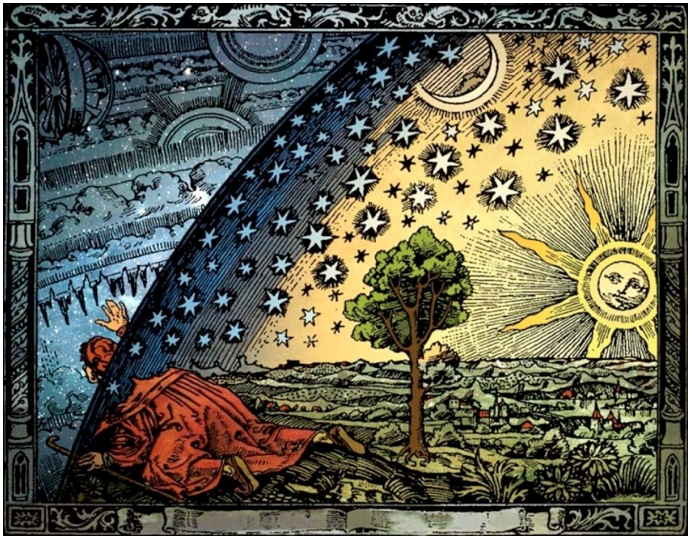 It is for this reason I always show students this picture of Camille Flammarion, L’Atmosphere (1888). Once you have managed to understand the way in which your existing mental models can really restrict the way in which you see the world, the way in which you see meaning in the world, you can begin to shed some of more limiting ones, and begin to take new ones on board, new mental models which allow you to perceive complexity in a new way, in way in which can help you solve problems, paradoxical and complex problems which before seemed intractable. I write this article towards the start of Rio+20, a summit that aims to find a balance between economic growth and environmental protection. This is one of the world’s largest and most important conversations which can help shape the future sustainability and resilience of life on this planet, but as the Guardian reports, there is still a huge issue relating to the actual definition of sustainable development. What I am trying to do with students is to follow the advice of the Nature Institute’s Craig Holdrege, and to teach them to think as plants grow. It is a challenge for students to put themselves through this great learning journey, but as I hope you can see from their responses after this teaching, their thinking becomes widened and their consciousness transitioned to a new way of thinking, seeing and knowing. It is to Sustentare’s great credit that they are developing course modules of the highest calibre in Brazil, where students can begin to learn how to enter into this new way of thinking. I hope that it is not long before Brazilian companies, with this new generation of business leaders really begin to transform and develop their strategies and organisations to the benefit of both themselves and society and this planet we all share together. Thanks for sharing, Simon, really good to know that Brazil is offering this type of course and that students are starting to move to a new way of thinking. Congratulations for your work! Reblogged this on Knowledge Team.